To understand structural unemployment, we begin by reviewing how unemployment arises from minimum-wage laws. Although minimum wages are not the predominant reason for unemployment in our economy, they have an important effect on certain groups with particularly high unemployment rates. Moreover, the analysis of minimum wages is a natural place to start because, as we will see, it can be used to understand some of the other reasons – structural unemployment. 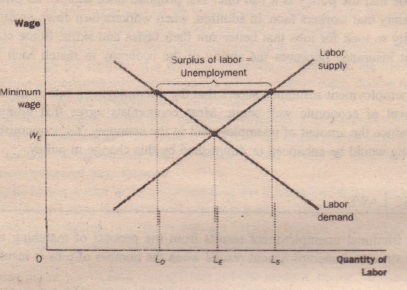 Figure 4 reviews the basic economics of a minimum wage. When a minimum-wage law forces the was to remain above the level that balances supply and demand, it raises the quantity of labor supplied and reduces the quantity of labor demanded compared to the equilibrium level. There is a surplus of labor. Because there are more workers willing to work than there are jobs, some workers are unemployed. While minimum-wage laws are one reason there is always some unemployment in the U.S. economy, they do not affect everyone. Most workers have wages well above the legal minimum, so the law .does not prevent the wage from adjusting to balance supply and demand. Minimum-wage laws matter most for the least skilled and least experienced members of the labor force, such as teenagers. Their equilibrium wages tend to be low and, therefore, are more likely to fall below the legal minimum. It is only among these workers that minimum-wage laws explain the existence of unemployment. Although Figure 4 is drawn to show the effects of a minimum-wage law it also illustrates a more general lesson: If the wage is kept above the equilibrium level for any reason, the result is unemployment. Minimum-wage laws are just one reason wages may be “too high.” In the remaining two sections of this chapter, we consider two other reasons wages may be kept above the equilibrium level unions and efficiency wages. 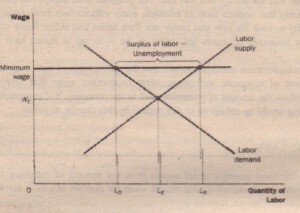 The basic economics of unemployment in these cases is the same as that shown in Figure 4, but these explanations of unemployment can apply to many more of the economy’s workers. At this point, however, we should stop and notice that the structural unemployment that arises from an above-equilibrium wage is, in an important sense, different from the frictional unemployment that arises from the process of job search. The need for job search is not due to the failure of wages the balance labor supply and labor demand. When job search is the explanation for unemployment, workers are searching – for the jobs that best suit their tastes and skills. By contrast, when the wage is above the equilibrium level. the quantity of labor supplied exceeds the quantity of labor demanded,. and workers are unemployed because they are waiting for jobs to open up.